“… it was a dark and stormy night…” Or so goes the often-mocked and parodied phrase. 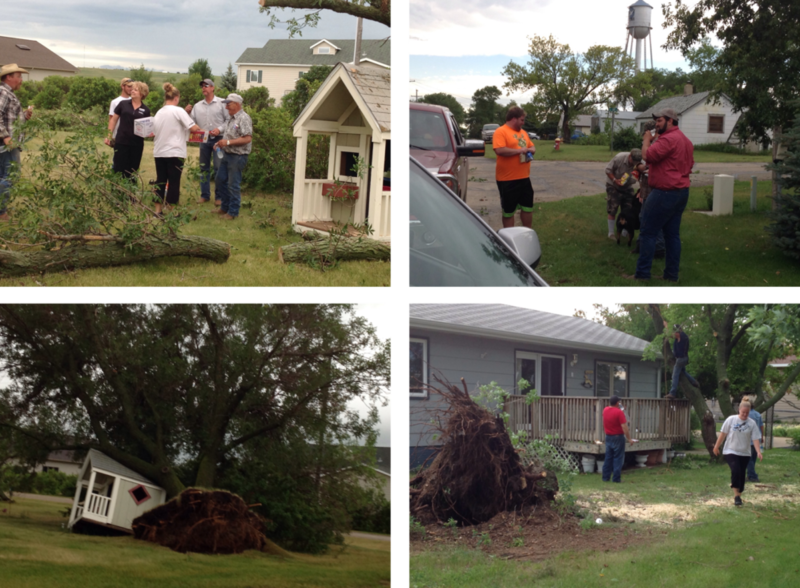 But Rhonda Schlecht, Personal Banker, and Karen Schlecht, Senior Frontline Specialist, both from Medina can tell you firsthand about a real storm that hit Medina in July that was not to be mocked. The morning after the storm, both Rhonda and Karen called Shelley Szudera, Director of Marketing saying they wanted to help their friends and neighbors clean up, but they knew that their small staff was down to two that day. So the three of them started to brainstorm. They couldn’t pitch in right away, but they came up with a plan to have food and drink delivered to the people who were helping with cleanup. Rhonda called her daughter Caitlin, and had her pick up food, water and treats at a grocery store in Steele, then drive them to Medina. A quick authorization to close the bank over the lunch hour, allowed Rhonda and Karen to venture out into the community. They were then able to make deliveries of the much needed nourishment to the hard working community members who were picking up the pieces from what the storm tore apart. The volunteers were surprised and grateful when the food arrived and joked that they could work the rest of the day on it. Then they asked “When is the beer coming?” So, ever ready to help, Rhonda volunteered with a local establishment where she helped cover the bar while they served a hot meal and much needed beverages to those who spent a long day laboring to fix up the town they love. Rhonda and Karen, with more than a little effort, a few phone calls, and a lot of heart were able to prove that even when you’re short staffed, it’s always possible to do the right thing for your community.